Gordon Ramsey needs to step aside as our own campers are learning the fine art of cooking. 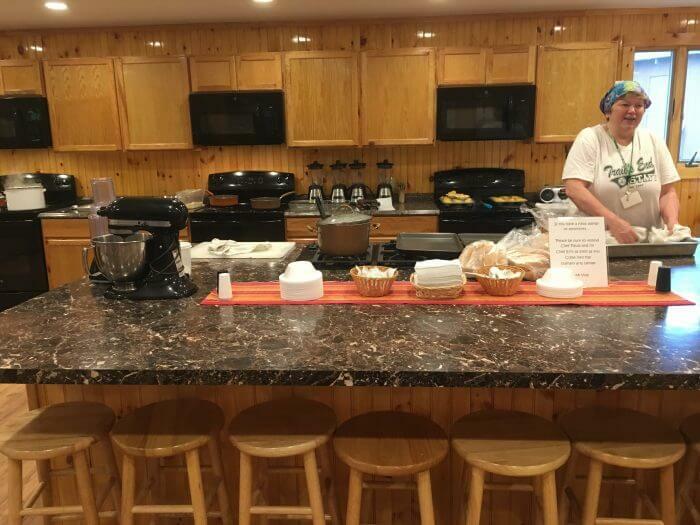 Campers are now able to become chefs at Trail’s End Camp, from Cooking with Paula. Paula, a chef during the year at a sorority house, works in cooking at the creativity center, to teach our campers how to cook, in a fun way! Campers have many options to make something special, whether it is as simple as chocolate chip cookies, or as complex as a triple layer cake. Campers are taught how to prepare their food, cook their food and of course clean up the kitchen. Our older campers get the privilege of doing something special. 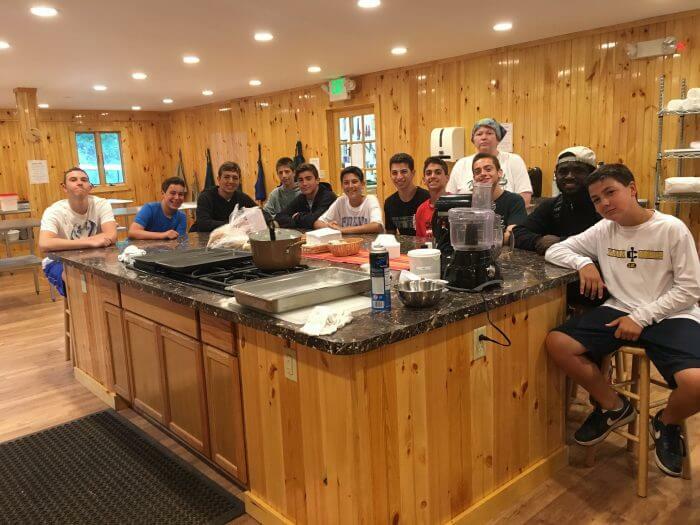 14 times over the summer, our varsity campers get to cook their own dinner. Chef Paula will be teaching the campers about many different options they can prepare at meal time. This week, our First Year Varsity boys cooked omelettes for dinner, which looked delicious! We are certain that campers will be excited to share their culinary skills with their families when they return home. This entry was posted in Camper and tagged 18405, Camp Family, Camper, Connections, Family, Friends, Home, Spirit, Summer on July 24, 2016 by Marc Honigfeld. College Day or what some call a “mini” Olympics, broke out Tuesday around 4:00 pm. The teams for the 2-day competition were the South Dakota State Jack Rabbits, University of North Texas Green Horns, and lastly, the San Diego State Aztects. These last two days gave our Second Year Varsity campers a chance to come together as a group, and lead camp through a sports-filled friendly competition. The Second Year girls, matching with their French braided hair, as well as matching shirts, and the boys matching in their button downs, showed the rest of TEC how they’ve been ready for this moment the day they walked through the gates. A boy and girl, who have been overall great leaders and campers, are chosen and rewarded to be in charge of one of the three teams. However, each Second Year camper gets a role, whether being a rope burn captain, an athletic captain or a cheer captain. College Day started off with the traditional running of the bases, which was filled with spirit and sportsmanship. The next day was followed by a morning and afternoon filled with competitive sports such as soccer, softball, flag football, relay races and more. Of course the Varsity European hand ball game was the all time favorite. 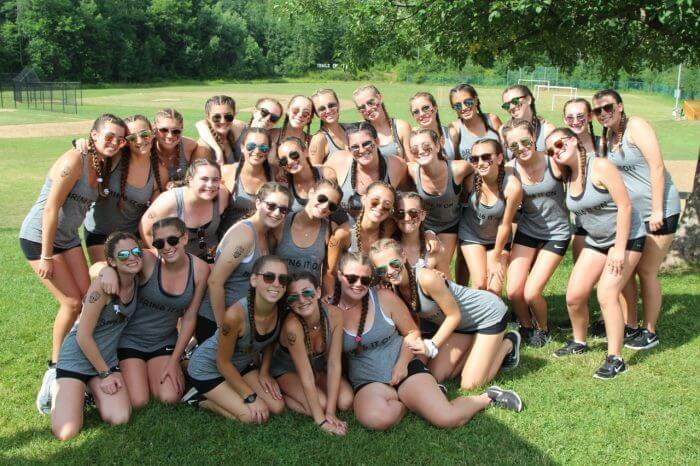 New talents were found, and new relationships between different ages were built as each Second Year put their best foot forward to make sure all of the campers and staff’s College Day experience was the best one yet. College Day ended with the famous rope burn. Four Second Year campers, who have been looking forward to this since their first College Day, work together to build that fire higher, higher hoping to burn the 8 ft. tall rope. The lucky winners were the Yellow Jack Rabbits who swept Rope Burn and Overall Cheer, making them the Overall College Day winners. 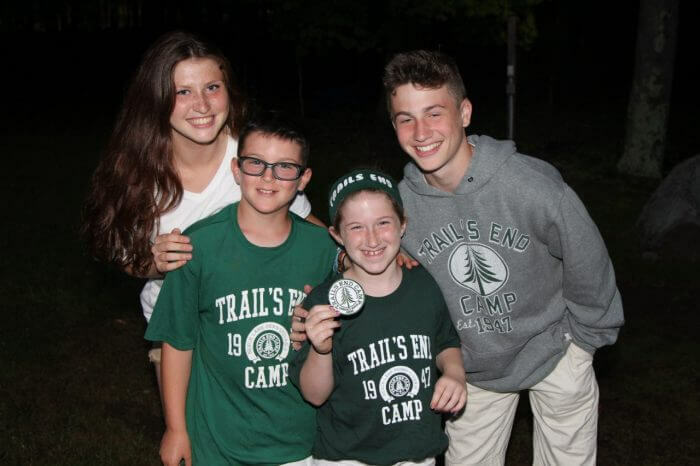 This entry was posted in Camper and tagged 18405, Camp, Friends, Home, Spirit, Summer Camp, Summer Home, TEC, Tradition, Trail's End Camp, Varsity on July 11, 2016 by Marc Honigfeld. “Friendships deepen through years with thee, lasting till eternity,” is a quote that every Trail’s End camper and staff member holds true to their heart. Friendship is one of the many gifts a camper is given from their experiences at TEC. Trail’s End gives everyone the opportunity to grow in many ways. 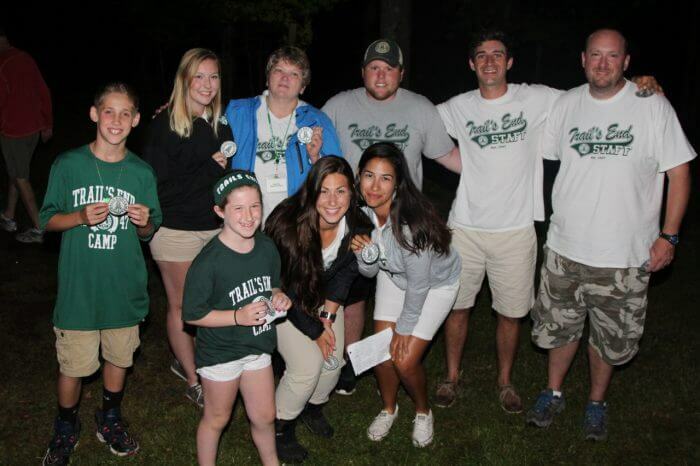 Every week, specific campers are rewarded with different color dog tags to reflect their good character that was exhibited the previous week. 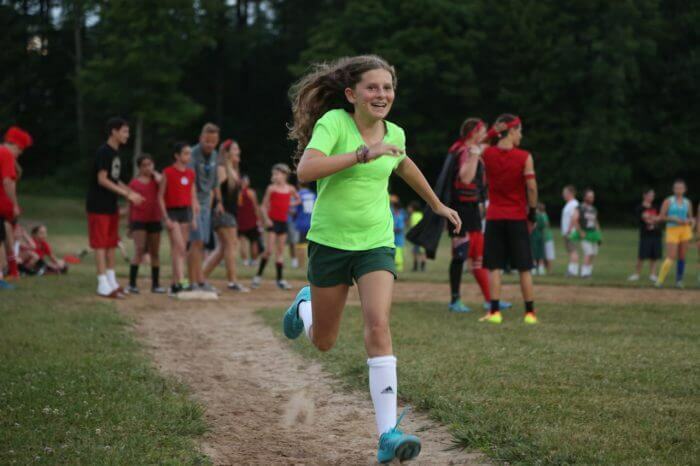 As the children accumulate a number of them, we love to hear the sounds of success as they run around camp. A few years ago, we implemented our Community Service Awards which are given to staff and campers who go above and beyond what is expected at camp. This award is extremely special, as it is only given to a select few each week and recognizes a sense of selflessness with putting their camp family before themselves. Every week, after Friday night services, the Community Service Award winners are called down, after the person that nominates them, reads off why they were nominated. It is truly an honor to see the faces of the surprised honorees as they are called down to stand in front of the entire camp. This week, the Community Service Award winners were: Jeff Donaldson, Brandon Hoovis, Coleman Perret, Paula Kemp, Maddi Webb, Adin Kurtz, Monica Briceno, Caila Bender and Brooke Selmer. Congrats to this week’s winners! This entry was posted in Camper and tagged 18405, Camp, Camp Family, Camper, Family, Friends, Home, Spirit, Summer, Summer 2014, Summer Camp, Summer Home, Sunshine, TEC, Traditions, Trail's End Camp on July 8, 2016 by Marc Honigfeld. 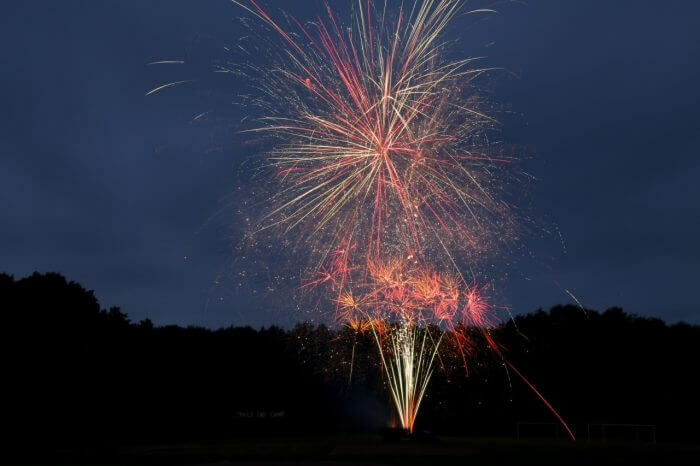 Trail’s End Camp hosted the largest BBQ in Beach Lake, for the Fourth of July Monday night, continuing the tradition of hot dogs and hamburgers on America’s birthday. 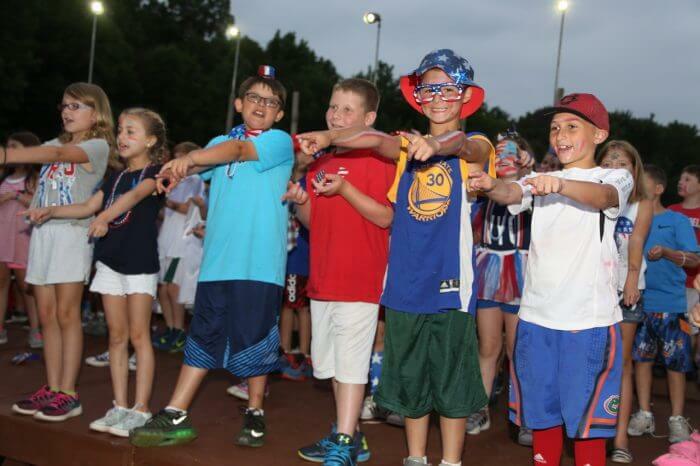 The July 4th spirit was in the air last night, while the Buddies and Rangers put on a show for the Trail’s End Camp family. The cook out slope was colored in shades of red, white and blue as everyone was painted from head to toe in our nation’s patriotic colors. The youngest, but loudest campers participated in our annual Fourth of July show proudly representing our country’s Independence Day. 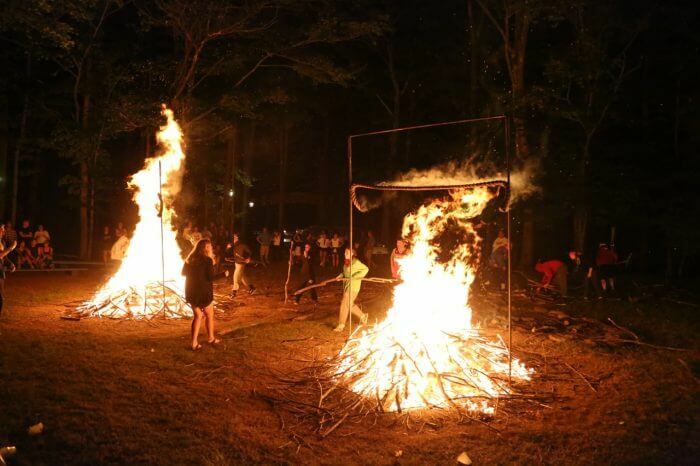 The night began with campers performing traditional songs while the entire camp was singing and dancing along. The cook out slope was filled with smiles and laughs, showing all of the new friendships that were formed over the past week. After a fun concert, beautiful fireworks exploded over the sky to end the night. The Fourth of July show is an important tradition at TEC that has been in place year after year. This special event also enables the youngest campers to show how important they are to our TEC family. Many campers were able to step out of their comfort zone to either crack a joke, or have a solo in a song on stage. 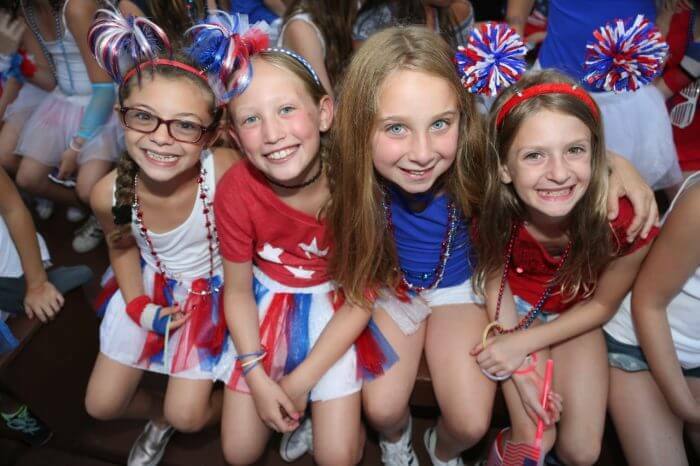 The July 4th show is one of our favorite events in camp that gets the second week off to a great start. This entry was posted in Camper and tagged 18405, Camp, Camp Family, Camper, Connections, Family, Friends, Home, Spirit, Summer Camp, Summer Home, Sunshine, TEC, Tradition, Traditions, Trail's End Camp on July 6, 2016 by Marc Honigfeld.